The report by Transparency Market Research (TMR), the global chemical sensors market has highly fragmented in nature due to the presence of numerous players operating in the global market. Some of the key players in the market are Alpha MOS, Denso Corporation, Delphi Automotive plc, Honeywell International Inc., ABB Group, F. Hoffmann-La Roche Ltd., The Bosch Group, Halma plc., Siemens AG, Emerson Electric Co., and Yokogawa Electric Corporation. Among these companies, the companies such as Honeywell International Inc., Emerson Electric Co., The Bosch Group, ABB Group, and Siemens AG collectively accounted for the share of nearly 19.8% in 2015. 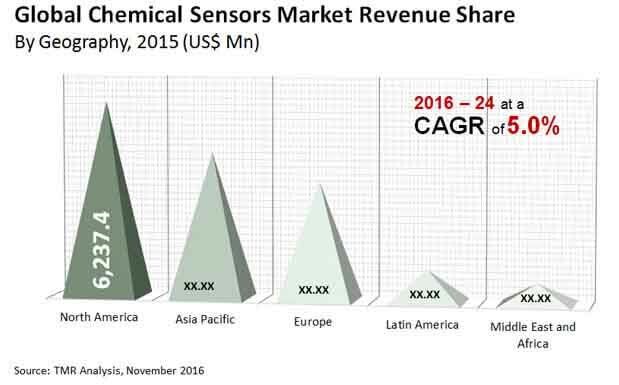 Research and development activities for the development of novel and advanced products are leading to gain more shares in the revenue of the global chemical sensors market. According to a report by Transparency Market Research (TMR), the global chemical sensors market for is expected to expand with a steady CAGR of 5.0% from 2016 to 2024, to attain the value of US$24.8 bn by 2024 from US$16.3 bn in 2015. Based on the end-use industry, the segment of the medical industry is dominating the market due to the adoption of new technologies for the treatment of numerous diseases. Based on the type of products, the optical sensors segment is witnessing the highest growth owing to the increasing usage of the sensors in the numerous industries. Region-wise, North America is dominating the market owing to the high growth of the automobile industry and research activities in the region. Increasing adoption of chemical sensors in numerous end-use industries such as medical, motor vehicles, and processing industries is fuelling demand for chemical sensors. This is a key factor driving the growth of the market. These sensors have extensive applications in the oxygen plants, food & beverage, motor vehicles sensors, processing industry, industrial safety & emission, chemical processing industry, industrial safety systems, environmental monitoring, water & wastewater, emissions monitoring, automotive emissions testing, defense, and homeland security. Increasing demand for chemical sensors for the aforementioned applications is boosting demand for the chemical sensors market. Additionally, chemical sensors are used in fertility treatments, cancer diagnosis, portable glucose monitors, drug and alcohol abuse diagnosis, renal failure diagnosis, and blood sugar testing strips. Increasing demand for quick and accurate detection process in the healthcare industry is expected to fuel the growth of the chemical sensors market. Despite these growth opportunities, the declining automobile emission testing is hampering the growth of the global chemical sensor market. Nevertheless, chemical sensors are increasingly used in the identifying and transforming information for converting chemicals into analytical signals. Additionally, need for monitoring levels of pollutions and for homeland security and defense purposes due to growing environmental concerns are augmenting the growth of the chemical sensors market.